The Best Medical News In Ages! Dark Chocolate – not white chocolate or milk chocolate – is good for you. As there is no question that chocolate procures pleasure for those who eat it, you never need to feel guilty again! Eating 2 ounces (50 grams) a day of plain chocolate with a minimum content of 70% chocolate solids can be beneficial to health, providing protection against heart disease, high blood pressure, and many other health hazards. Also essential trace elements and nutrients such as iron, calcium and potassium, and vitamins A. B1, C, D, and E. Plus it is a lot tastier than boring old vitamin pills too. A 1 1/2-ounce square of chocolate may have as many cancer-fighting antioxidants as a 5-ounce glass of red wine. About 50% of all food cravings are for chocolate. Far more than cravings for “something sweet” (16%), salty foods (12%), baked goods (11%), and fruit (4%). Some people go so far as saying they are addicted to chocolate. But that is no license to go on a chocolate binge. Eating more dark chocolate can help lower blood pressure. Remember, you do have to balance the extra calories by eating less of other things. A word of caution: Not all chocolate is heart healthy. White chocolate, which a Harvard researcher points out is “not really chocolate at all,” and milk chocolate may expand the hips rather than help blood flow. None of the instant cocoa mixes in the local grocery store contain the flavonoids that improve blood vessel function. A new study by market research publisher Packaged Facts titled Market Trends: The U.S. Market for Gourmet Chocolate reports that the higher cocoa, lower sugar content and antioxidant properties of premium dark chocolate are making it a more attractive treat for health-conscious Americans, especially those counting carbs. The potential health benefits of premium dark chocolate versus higher sugar, higher fat mass-market counterparts are causing consumers to reevaluate their attitudes toward the gourmet chocolate market. 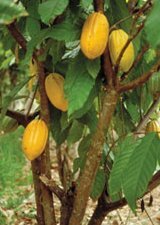 Cacao trees are often inter planted with tall shade trees to protect them from direct sunlight. Pods grow on the trunks and larger branches of the trees and take five to six months to ripen. Fruit on the higher branches are harvested with blades on long handles and lower branches are cut with machetes. The pods are cut open with machetes to reveal between 20 to 40 beans each, surrounded by a mass of stickly, white pulp. Traditionally, this was done immediately after harvest; today, pods are sometimes first stored whole for a few days to prime them for fermentation. Fermenting begins when the beans come into contact with the air. Here, a worker uses a stick to gauge the depth of the mass in a vara, or measuring box, to determine the wage of the harvester, before transferring it to the fermentation bin. During fermentation, the pulp disintegrates, producing steamy heat and a pervasive, yeasty, sour smell. It is at this point that the beans first develop thier complex characteristics. Drying of the beans after fermentation is done on slatted wooden trays in the open air. The beans are spread out evenly and raked periodically so that they dry uniformly. As the beans dry, their colors deepen, turning them into a carpet of sepia, umber, and mocha. Aeration of the dried beans during storage is important to prevent the formation of mold. A worker tosses beans with a shovel to expose them evenly to the air. Grading of the beans is done mechanically at the larger farms; smaller producers do it by hand. From baskets, the dried beans are transferred to burlap bags and transported to local selling stations, where they may be bought by large companies for export. Arriving at the chocolate mills, the beans undergo a thorough cleaning, followed by the roasting which brings out the particular flavor of each variety. Throughout this process, a constant and exact temperature must be maintained. Correct roasting is exceedingly important since under-roasting leaves a raw taste and over-roasting results in a high pungent or even burnt flavor. Now comes the cooling, shelling, and winnowing, from which the cocoa beans emerge cleaned and ready for blending. This important process requires expert knowledge and skill. Not only must the beans be selected which will produce the best chocolate flavor, but uniformity of blend must be preserved year in and year out. After the blending, the cocoa beans are milled or slowly ground between great heated millstones. Under heat and tremendous pressure, the cocoa butter melts and mixes with other parts of the beans forming the ruddy chocolate liquor. The fragrant chocolate odor is now noticeable. The liquor is then treated according to the product to be made. For unsweetened chocolate, the liquor is poured into molds and cooled rapidly in refrigerating rooms. Then the cacao emeres in familiar form, as bars of chocolate, ready to be wrapped and sold. Chocolate Glossary – Types of Chocolate – All chocolate is not created equal. When shopping for your chocolate look at the label to find the percent of cocoa butter contained in the bar. The cocoa butter is where all the flavor and texture is. The higher the percent, the better the chocolate. History of Hot Chocolate – There is a difference between hot cocoa and hot chocolate. The terms are often used interchangeably, but technically they are as different as white chocolate and bittersweet chocolate. History of Milk Chocolate – The development of milk chocolate by Daniel Peter changed the flavor of chocolate around the world. In 1887, Daniel Peter adopted the original formula for what was to become the first successful milk chocolate in the entire world. Chocolate Substitution Chart – Need a quick substitution for chocolate? Here are some chocolate substitutions, but remember not always do they work as well as the original recipe ingredient. How To Melt and Temper Chocolate – Guidelines For Melting Chocolate. Chocolate Clay Roses – These delightful chocolate roses can be used as edible decorations for a cake or to create a basket of blooms. This edible clay can be also used as a modeling clay for making other figurines and objects. The soft pliability makes it easy to work with. These chocolate roses are so easy to make that even children enjoy making them. Dutch-Process Cocoa vs. Unsweetened Cocoa – Learn about the differences between different types of cocoa.